We supply a wide screw compressor filters to meet the huge market demands. These screw compressor filters are extremely suggested by the users with its good quality and performance. We have three catagories of screw compressor flters. We accept custom orders based on special size needs. 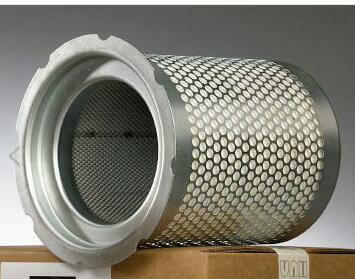 our filters are 100% Replacement and Compatible with the original screw compressor filters. The major international brands like atlas copco, kaeser, ingersollrand, boge, fusheng, Kobelco, hitachi, kaishan,Elgi and others. Air Compressor Oil separator is an important compressor filter element to decide the quality of compressed air. 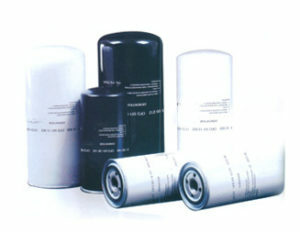 The compressed air carries big and small oil drops. The big ones are easy to be separated. But the suspended small oil particles must be filtered by the glass fiber filter layer in micron of the oil separator. This screw compressor filters can guarantee the coming out air quality under the correct pressure without oil and impieties. its service life could be longer up to 6000-8000 hours. Our compressor oil separators have the features of long service life, low differential pressure, high efficiency, easy for replacement and strong reliability, which can save the operation cost of the users. Air Compressor Oil filter can not only filter particle contamination such as dust and metal particle, but filter glue material in oil and reduce probability of jam, so as to effectively extend service life of machine bearing and running parts such as male and female rotors. The air compressor air filter can mainly filter most dust impurities in the air, which is the first barrier to protect the screw end, valves and lubrication oil of screw air compressor. 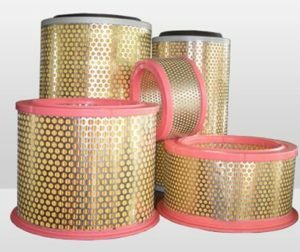 Comparing with low quality air filter element, good air filter elements work more effectively so as to extend service life of the oil separator element and oil filter element. This screw compressor filters can protect lubricating oil from contaminations as well and increase operation efficiency and life of air compressor.